Helping small business flow onto the web in North East Wisconsin. The origin of this phrase is unknown, however, the essence of this phrase can be used to describe the phenomenon where certain ‘professionals’ in any given area are so busy with work for their clients that they neglect using their professional skills to help themselves. 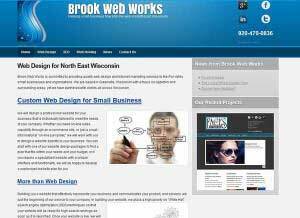 In 2007 when I started Brook Web Works, I built a website using Fusion. At the time, it was considered state of the art software for building websites. It did what I needed and generated leads for my new business. Since then I have not updated the website regularly, hence the phrase about the cobbler. Website technology has changed a lot since 2007, HTML5, CSS3, PHP5.5, MySQL5 just to name a few. New and improved content management systems like WordPress have evolved from a blogging platform to a website builder. WordPress has thousands of plugins that can be added to make websites perform different tasks. Here is a short list of just some of the things that plugins can do for this website and yours. Email Encoders, to protect your email address from spiders. Telephone number linker, click to call from mobile devices. Image sliders, with flash no longer being supported, sliders have taken their place. Triple redundant backups, daily local, weekly cloud, monthly network storage. Security plugin to protect the website from hackers. Google Analytics, I can track how many visitors I have to the website. SEO tools, to help with search engine optimization. Social media integration, auto post news / blog to any of our media channels with one mouse click. These are just some of the things that I have added to my new WordPress website. My great-grandfather Hugo Heuser was a shoe cobbler in Milwaukee Wisconsin. I can remember visiting his shop when I was very young and seeing all the funny looking tools used to make shoes. Today’s website tools may look funny to some but with a little training we can teach just about anyone to make changes to their website.